The MegaPro 15-in-1 Standard Bit Screwdriver can be used to replace numerous fixed head screwdrivers in your toolbox. Invaluable for saving time hunting for tools, it also saves space and weight. 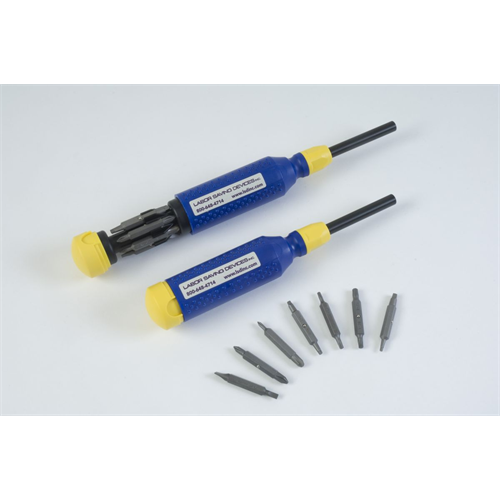 The screwdriver is made of high impact plastic and superior grade steel. The bits for both this standard model and the tamper proof bit model are made from industrial grade steel. The quick change bits supplied with the screwdriver can be stored in the handle. To increase the rotational torque and provide higher driving force, the screwdriver is designed with a rotating “palm” end cap. It also features a textured non-slip main body and a bit locking mechanism. This standard bit model is supplied with phillips, square drive, torx and slotted bit heads.